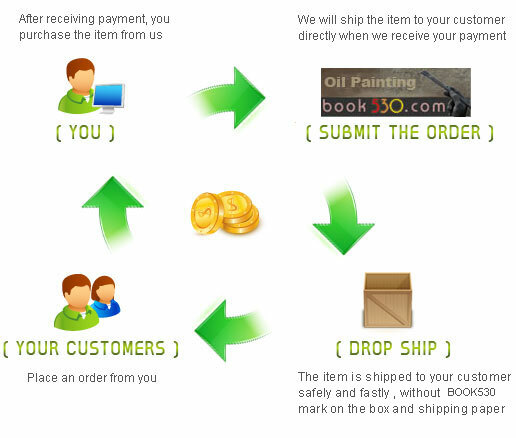 With oil painting dropship on eBay service, you can use this dropship service for any oil paintings to your friends or present as gift, or dropship for your own oil painting gallery for saving shipping costs. Drop shipping is a nature of retailing in which the retailer does not keep the product in stock, but passes the customer orders and delivery details to the wholesalers, who then ships the goods to the customer straight. That is to say, you only buy what you have already sold once you have got an order. In this way, for you who sell products on the intenet ,like eBay ,in catalogy,mail order ,etc, it is a convenient way for you to manage your business just at home without buying your products first. To start drop ship our products, please contact us firstly by sending an email to handarts@gmail.com We are pretty sure that our passionate and considerate sevices will enable you to easily and efficiently launch or expand a direct-to-consumer program. Welcome you at any time.